Your version of the bassinet purse is cute. Am thinking of making some of these for Make a Wish, if you wold not mind. Wish I could volunteer, but that is a 100+ mile round trip for me. They always need things for the kids so this is somthing I could contribute. 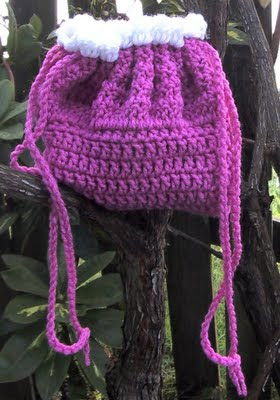 It is okay to make things from any of my patterns for donation. Just don't sell them for personal profit. Can you tell me how large is the baby? Thank you. Guess you missed where it says it is a six inch doll. I love this pattern. You made one for my daughter years ago and she carried it with her wherever she went. Thank-you for posting it! This pattern is a new improved version. In Round 6, is the beginning chain a chain 1 or 2? You said to start with a 6 inch tail with 21 chain .I can't seem to find what I am doing with the 6 inch chain that was left? this is exactly what I have been looking for I just bought my grandaughters 7" lots of love babys and need a bassinet for them. I know you said this is for a six inch baby but I can make it work. Thank you so much! I make things for our local Wish Tree every year and there's always a request for baby dolls. My problem is finding the dolls. Where do you get your 6" dolls? I'm unable to find them here. We're very remote and the only toy store is KMart. I haven't been able to find them online at a price plus shipping that is affordable. I haven't bought any for several years. I bought them at Wal-Mart and they were 99 cents. I will have to see if our store still carries them. If not maybe there is a slightly larger doll that I could upsize the pattern to fit. I was able to buy two of these at the Bellingham Wal-Mart this morning. So guess they are still selling them. Between Thanksgiving and Christmas they will probably have lots of them. I don't know what the dates are on these postings but I have been making these bassinet purses for a few years but want to try this pattern. I always bought the 6" doll at Walmart. Last week I went to 2 Walmarts in my area looking for them and was told they aren't going to sell them anymore. I can't find a 5" to 6" doll that is affordable. Has anyone found little dolls somewhere else? If Wal-Mart gets them in it will be before Christmas. That has been the only time I've been able to find them for a few years. The only other dolls I know of are the Berenguer 5 inch ones, they are usually $6. i found my 5" lil cuties doll at mary maxim for 5.99 and can get 8.5" and 10" lots of love for about 10.00 and 15.00 or less. i also use needle point canvas to make the purse with bed on top and a place to put clothes under/bottom of purse. Hi! I love this pattern. Thank you for postng it. Can you post the hood part of the pattern please? My dauhgter wants it and I promised I'd try it. I don't know the date of these posts but I found a doll at target. Its a little bigger but its only $3.50. Hi I lovethis pattern! Thank you for posting it. 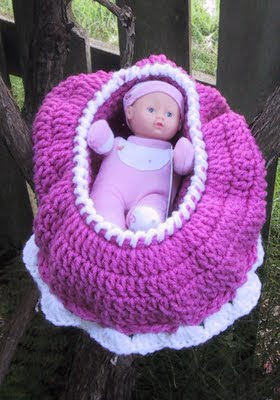 Can you post the bassinet hood part of the pattern please? My daughter wants it and I promised I would try to make it for her. As for the dolls I found one at Target for 3.50. There is a link to the original pattern that has a hood. I don't have instructions for the hood. I'm sure if you search online you can find others. 8/31/2015 --I found a little 5" doll at Target for 2.99. She is called a Moxie Girlz friend mini doll- Amoire. They had, at the time of my purchase, about 5 different looks for this brand of doll, all with different names. After I gave this to my niece, I also noticed that she put her Barbie brand Chelsea doll in here (really good fit). This also carries a whole herd of My Little Ponies. (LOL) She absolutely loves this. My sister says she takes it everywhere. Thanks so very much for posting this pattern. You have definitely made a child happy. Thanks for the info on the dolls. I love making this item. I want to know if I can donate to Salvation Army for little ones. I have a bizarre coming up Saturday. Is it ok to sell them at the bizarre. I love making this purse. I have a bizarre coming up Saturday. Can I sell them there. It only happens around Christmas. Yes you can sell them at the sale Saturday and donate to Salvation Army as well.